A sneak peek of the GYM, we’ve a site visit today after our Discussion, shifting of all the Equipment is scheduled on Saturday 10 October 2009 before noon. As you can see from the pictures, the work to convert the former shop lot into a gym is almost completed except for the installation of the giant mirrow. 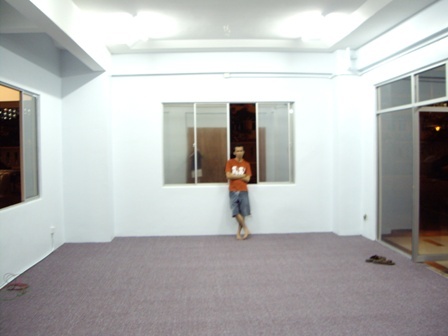 The carpet was laid. The lighting was done. The paintwork completed and the next task will be choosing a date to shift all the equipment into the gym. The gym will be opened to the residents once all the equipment are shifted. Goodnight and have nice day. We have taken some measures to link up the small gaps between the two roof to provide some relief to those who are caught in the rain. 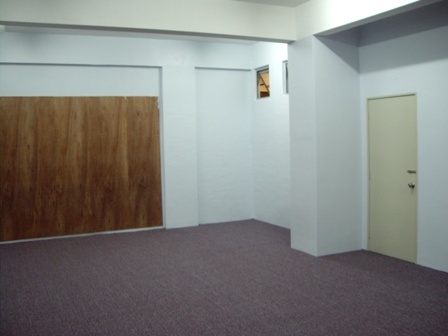 It was done by our handymen at no extra cost incurred at all. This could be a permanent measure or a temporary one to cover up the small gap. We wish that the residents are happy with the quality of work done. To us, they are acceptable. Good night and have a nice day. Just received the update from Hospital & Pn Normah that 3 suspected H1N1 confirm negative. They are not affected with H1N1. Its just a normal fever. Posting update at 10:20pm 3rd August 2009. 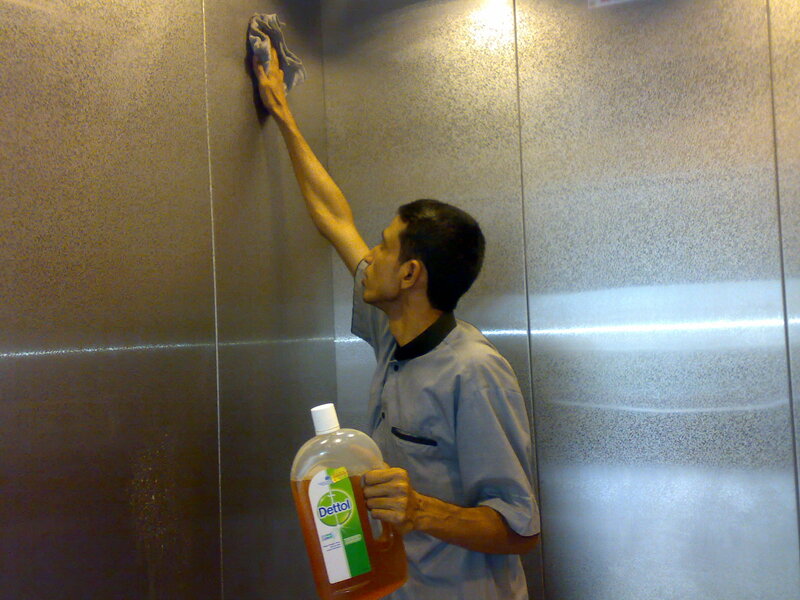 As a safety precaution, we have instructed the cleaner to sanitize Lift Lobby area with Dettol. Currently we’re waiting confirmation from the Hospital & Pn Normah. At around 7:00pm we were informed that 3 students from KLMU admitted to the Hospital suspected with H1N1, 1 students from Block A, 2 students from Block B.
KLMU has closed down their Nursing College at Platinum Walk effective tomorrow. We will keep update on the result of 3 students that were affected again at 10pm. Once we have a confirmation of the result we will post at Notice Board, Blog & Highrise. There are limited car parking lots available for RENT. Anyone who is interested please call the PVDPMSB office at 03-40241488. The JMC made the decision to renew the fire insurance policy with Tokio Marine TM life which is the biggest insurance company in Japan. If there is a total loss, we are insured for RM 90 000 000. Total loss is highly unlikely unless PV 10 is totally destroyed in a natural disaster. 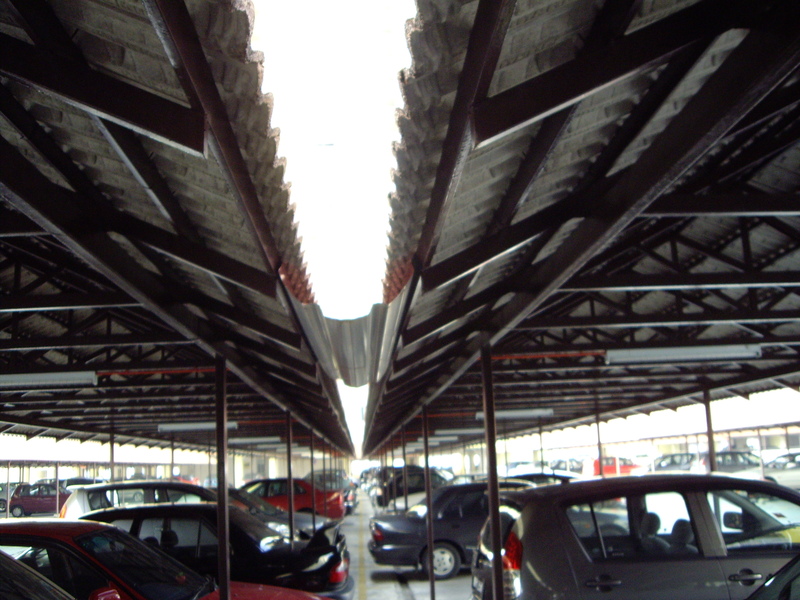 Our buildings are covered against fire, flood, earthquake and also malicious acts. We are also covered under a public liability policy against third party claims. The total premium that we have to pay is RM 83 315.30. This amount has to be shared by all the owners. I guess the total amount that each owner has to pay is about RM 100 as reflected in the latest statement. We cannot utilize the management fund to pay for the insurance cover. Our monthly collection is about RM 110 000. 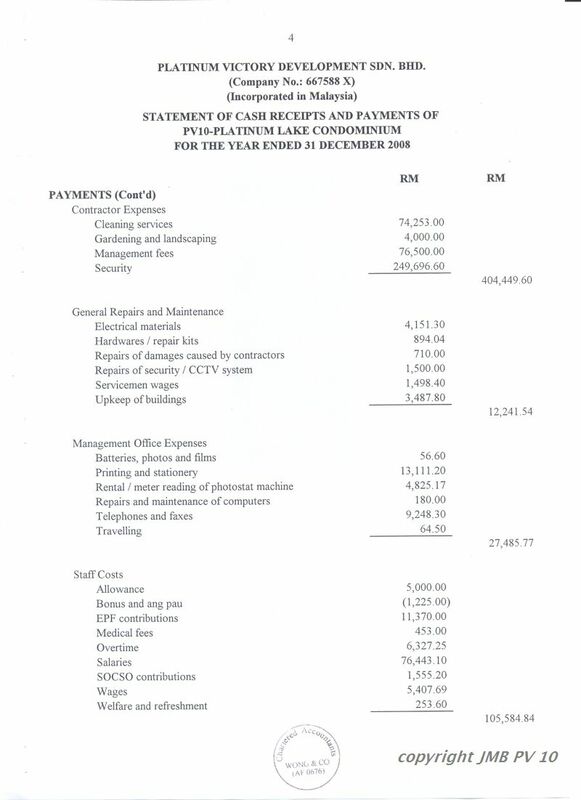 If we utilize RM 83 000 from the management fund to pay for insurance, we would not have enough money to pay for electricity bill and other bills. Goodnight and have a nice day. the premium paid is close to 0.1% of the insured amount. I hv no objection if it’s the best offer in town. Any comment? yr justification for cost sharing is acceptable this year but not the subsequent years when we hv sufficient BMF reserve to offset it. The premium looked huge when we compare it with our monthly revenue but chicken feed, merely 6.3% of our annual maintenance collection. Not advisable to impose additional cost other than the maintenance/water/sinking/land tax on owners to further burden them financially. How much was the premium last year? Last year was about RM 84 000. it was paid by you too. Are you saying that the premium is not yet paid? How come I have received the cert when we haven’t pay the premium? if i’m not mistaken, BMF fund was initially being used to offset the premium, a common practice in most of the apartment/flat/condo. We hv RM243k in BMF as of end of FEB, more than sufficient to offset the premium but JMC didn’t think so and decided to recover the paid premium from owners to maintain a deep pocket. It’s up to u to accept or reject their justification for doing so. the figure above looks good to all. don’t forget that , we haven’t made any payments for any bills yet. as for the insurance, no payment is made yet because insurance company usually gives a 60 day grace period. our maintenance fund does not cover the payment of insurance premium. I don’t think you can find any condo that uses its maintenance fund to pay for insurance premium no matter how strong its financial position is. if you are not clear on the issue, you may check with COB who can give you a better explanation. besides insurance premium which we have to recover from the owners, we also have to recover from the owners for the payment of quit rent. As for the assessment on your properties, DBKL will send the bills to you directly which comes to about RM 500+ per year. plis do not mislead owners on the COB. Section 22(3)(c) of the Maintenance and mgt Act 2007 (Act 663) for building and common property stipulated with clarity that BMF fund can be used to offset insurance premium of the condo. Based on yr above statement, what did u try to convey? Do u mean the closing balance of Feb to be carried forward to Mar 09 does not reflect the actual financial health of our BMF as most of or all the expenses in Feb are to be paid in Mar? Be reminded that our monthly BMF income is on progressive and not stagnant basis. The same applies to expenditure. May u plis enlighten us on the fixed cost for managing the condo to facilitate us assessing our capacity to finance insurance premium with our BMF fund? Variable cost of our expenses, esp for new projects, is a controllable cost and is manipulable. Not advisable to maintain a huge BMF fund at any one time as money is the root of all evils. This is a fact of life experienced by most of the cash rich KLSE listed companies which went bankrupt due to its huge cash reserve being siphoned out by unscrupulous executives with dubious transactions. whether you like it or not, we have to maintain a strong reserve for future expenditure like a repainting job or lifts refurbishment which may require a large amount of fund. Maintaining a large amount of fund will always lead to corruption is your personal perception. With you around to see that every single cent that we spent is made accountable, the JMC feels that the owners’s fund is in safe hand. You can rest assured that under this committee , your management fund will not be siphoned off to a secret bank account in Switziland. U still owe us an explanation for yr misleading statement on BMF can’t be used to cover condo’s insurance premium. How can this happened when we hv an insurance consultant by the name of CH Lim in our committee? The big projects 10 years down the road can be easily taken care of if we hv a short and long term set goal for our BMF reserve. With prudent budgeting and cost reduction practices, we shall be able to stay lean and mean to meet the financial needs when the time is due. Without any set goal, we are sort like short-sighted and working aimlessly. I understand that the JMC has decided to recover the insurance premium from owners. I have no objections about that and Mr See is right as I have not find any other condo is using the BMF to pay the imsurance premium. Section 22(3)(c) says that the JMC can use the BMF to pay for the premium. Fine. How about Section 8(2)? The JMB has power to collect only service charges from owner for the BMF. None is mention anywhere in the Act that the JMB has power to collect anything else from the owner except for the recovery of expenses incurred from orders of local authority. Is it Section 8(2)(g) allow the JMC to recover the said cost? Btw Mr See, the reserve you mentioned for the repainting and major lift maintenance should be build in the sinking fund, not the BMF. yr above comment is contradictory by itself. On one hand u said cost sharing by owners for insurance premium is a norm in all the stratefied properties and on the other hand u queried the legal right of JMC to recover the said expense. The onus of our argument is on whether BMF can be used to cover for the insurance premium. There’s no question over the answer since it’s mentioned in section 22(3)(c). As such, setion 8(2)(c)/8 (1)(e) below is not applicable to insurance premium which is a planned expenses stipulated in section 22(3)(c) and should not be considered a nuisance to be abated,legally speaking. (e) to comply with any notices or orders given or made by the local authority or any competent public authority requiring the abatement of any nuisance on the common property, or ordering repairs or other work to be done in respect of the common property or other improvements to the property. 8(2)(g) empowers JMC to recover the premium on reasonable ground. In another words, JMC has to justify itself to do so. Owners in concert hv the final say. If big expense items that worried Mr See the most, such as repainting and lifts refurbishment are taken care of by sinking fund as u mentioned earlier, then BMF fund should rightfully be used to offset the premium. We should consider use BMF fund to offset the premium. This JMC members should go!!!! Next AGM Meeting! we should do what we supposed to do. you are barking with no reasons. change the jmc members will it solve any problem. they are all volunteers not paid to work. you should appreciate that. you think a new committee can do better just try and see. since the most expensive cost items such as lifts refurbishment and repainting are being taken care of by sinking fund, we need yr justification on why we couldn’t afford to use BMF to offset the insurance premium. We shall put the issue to vote in the impending AGM. Meanwhile, blog commentators are advised to state their stand here. B4 the final decision is made, we shall call off the cost sharing decision made by JMC and immediately remove the item from the itemised bill. whatever need to be said by me is said. U all are urged to state yr stand here b4 it’s too late. If many low and medium cost stratefied properties with much bigger land area can afford to use their BMF to do so, why can’t PV10? The RM84000 premium is a meagre amount (@ 6.3% of the annual BMF revenue) to our BMF and can be easily offset with savings from prudent cost management and gradual reduction of security cost which currently stands at >RM31000 a month. If block intercom network (press an intercom button to open lobby door) linking lobby to individual unit was set up by developer at reasonable cost earlier (another of developer’s blunder that incurs heavier cost on owners), we don’t hv to station a guard each at all the 4 blocks. The annual saving of shrinking the security force from 18 to 10 is RM1680000, deriving from 45% saving. We shall now review the feasibility of installing the intercom network. The above-mentioned saving can also be utilised to increase guards’ wages to secure quality security service to eliminate once and for all the excuse of poor security services due to low wages, commonly quoted by JMC. Please don’t mislead the owners by mentioning that some of low cost and medium cost apartments are using the BMF fund to pay for the insurance premium without any reference. Name the apartments that do so. Since you were from another condo before you moved into PV10, We will like to know whether did the management over there use the BMF to pay for the insurance!!!! For your info, after paying for all the bills ( except for the security ) for the month of Feb and March, we have only a balance of 70K + in the bank. The security bill for Feb and March is 60K. When the liability period is over, we also need to pay for the routine maintenance of the lifts and the pool. Mr Raymond , please make an appointment with any of the committee member or the chairman to browse through all the payment vouchers. Just name the day and the time at your convenience, I shall be there. As stipulated in the Act 663, an owner has every right to make a request to look into the account so by all means exercise that right. The bank statements are all there in the JMB office, practically at your door step. You are practically misleading the owners without having the details of the account. For your info, PV 5, a condo at Taman Melati which is not managed by PVDPMSB is using the singking fund to pay for the insurance premium before they recover the insurance premium from the owners. Assuming that all the owners paid up, we collected about 120K for sinking fund every year. In a period of ten years, we collected only about 1.2 million. A repainting job may cost about 1 million in ten years time after accounting for the increase in labour cost and the paint. In ten years time, you may need to replace the controllers of the lifts which may have a lifespan of 10-15 years ( Genting Court management change 6 controllers at the cost of 300K + after ten years ). Our controller may cost about 100K in another ten years. We have ten lifts. It may cost us another million. Considering that we do not increase the maintenance fee for the next ten years and when the liability period is over, we shall have very little surplus left. To make ourselves popular, should we decide not to recover from the owners for the payment of insurance premium or later the quit rent, we shall run the risk of managing our properties with a budget deficit. We may need to dig into the sinking fund for any contigencies if we do not have any reserve in the BMF. As for the current JMC, our main objective is to build up a strong reserve which will be inherited by the next JMC in the future. We shall not make ourselves popular by making a decision which may get us into the difficulty of balancing the budget. I just mention two items ( the lifts and a repainting job ) which requires the utilization of the sinking fund. What about the WATER PUMPS, THE GEN-SETS, THE AUTO GATE, THE WATER PUMPS FOR THE POOL, THE WATER TANKS ON THE ROOF TOP, THE GYMN EQUIPMENTS AND OTHERS. These things will not last forever. All these items have a lifespan. We need fund to repair or replace them. WE NEED TO USE THE SINKING FUND TOO! The committee members are all owners too . They made a decision which requires them to pay for the insurance premium. They do wish to utilize the BMF to pay for the insurance premium but after considering all the figures made available to them , they feel that it is not a prudent step to take. We do want to make a decision that benefits ourselves and make ourselves popular but we just can’t for the sake of the future. A good example is the Genting Court Apartment, the first property that I purchased in the late nineties. The apartment is almost ten years old. I was the vice-chairman in the R.A. there and now I am the treasurer in the JMC. If you use the Jln Genting Klang, you are able to see the building on the left hand side. From PV10, if you use a short cut leading to Jln Gombak heading to the city, you have to pass by Prima Setapak and later Genting Court. Just look at the condition of the building. We have no fund for a repainting job. We asked around and were told that a repainting job cost about 700K. The gen- set is not working. The water pumps need to be repaired. The pool is running on only one pump. The water tanks on the roof top are in a bad condition. The security is bad because we don’t have the budget to hire extra guards. 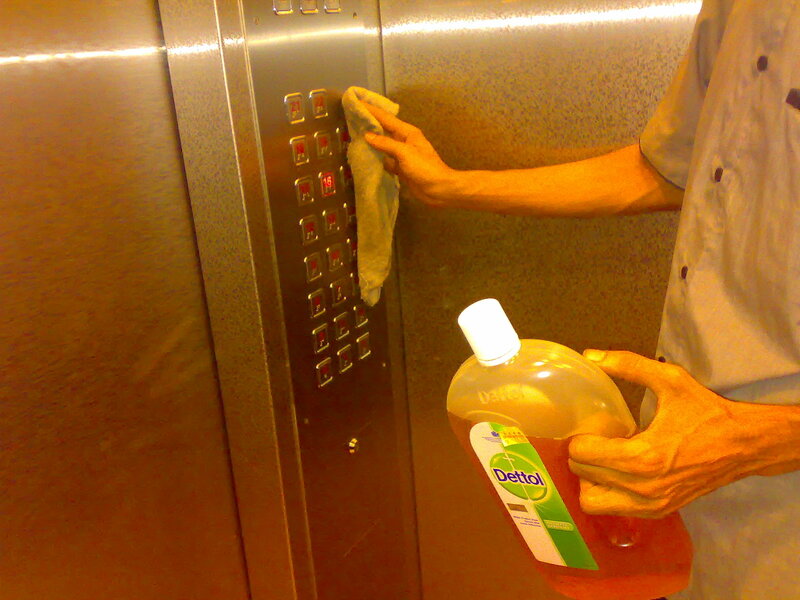 ALL are reserves had gone towards replacing the controllers for the twelve lifts. Our lifts are of Mitsubishi brand. We can’t afford to use Mitsubishi controllers because each one cost about 100K so we used the Taiwan made and China made brand for the controllers. The first six were done last year. The other six were done 4 years ago. Total cost is 600K +. We don’t have much reserve now. 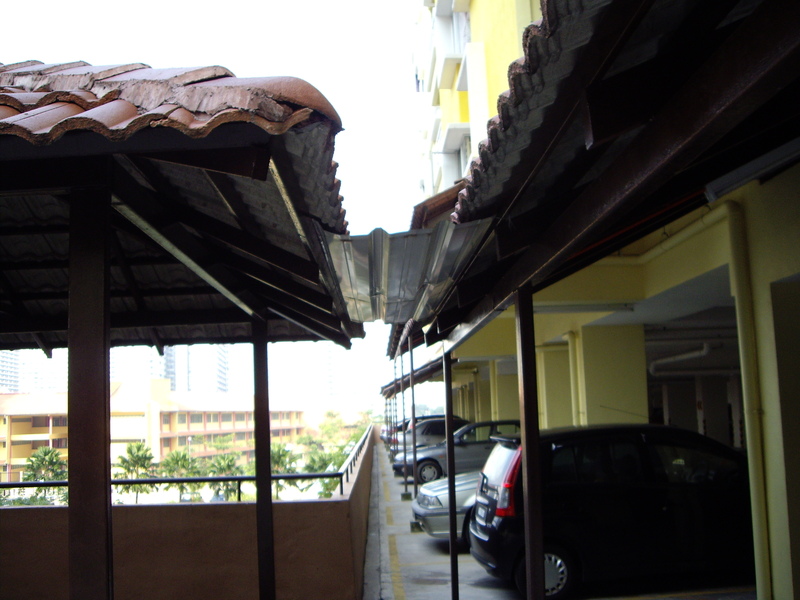 The owners screamed when we increased the maintenance fee from RM 65 to RM 70.00. We collected about RM 10.000 a year for sinking fund assuming that all paid up. The density of Genting Court is 1000 units. In ten years, we managed to save only about 900K. This is estimated amount that we may save for PV 10 in ten years time. Our fate may be similar to Genting Court if we do not have a strong reserve. For that reason, we simply cannot use our maintenance fund to pay for the insurance premium. Recently, the JMC of Genting Court made a decision to replace the hoisting rope ( the rope used to carry the lift car ) and the shifts for four lifts . The lifespan of the rope is over. Should we decide not to change, we shall fail the annual JKPP inspection ( JKPP may stop the running of the lifts) and may endanger the lives of the users. The total cost is 80K. See Said : We don’t have much reserve now. 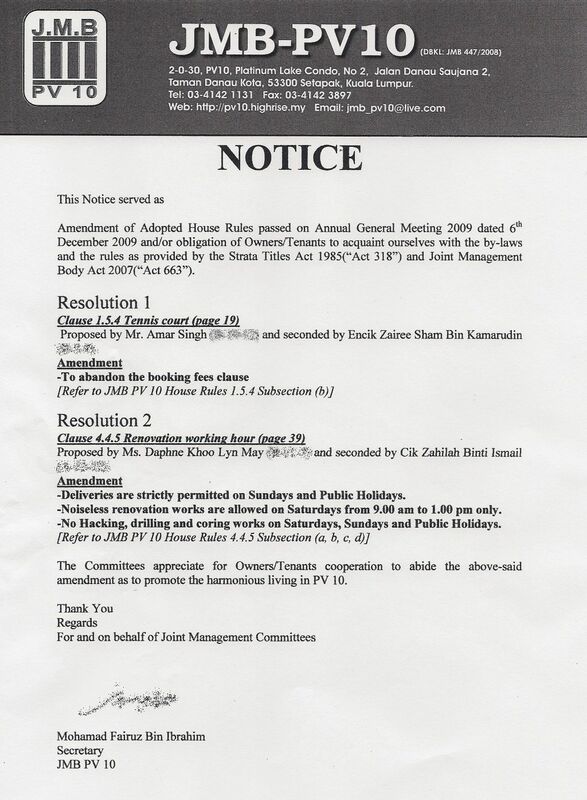 The owners of Genting Court screamed when we increased the maintenance fee from RM 65 to RM 70.00. We collected about RM 10.000 a year for sinking fund assuming that all paid up. The density of Genting Court is 1000 units. In ten years, we managed to save only about 900K. This is estimated amount that we may save for PV 10 in ten years time. Total : RM834k in excess or 750k more if 84k is used to offset insurance premium annually. In 10 years time, we are cellecting 8.34mil more than GC. 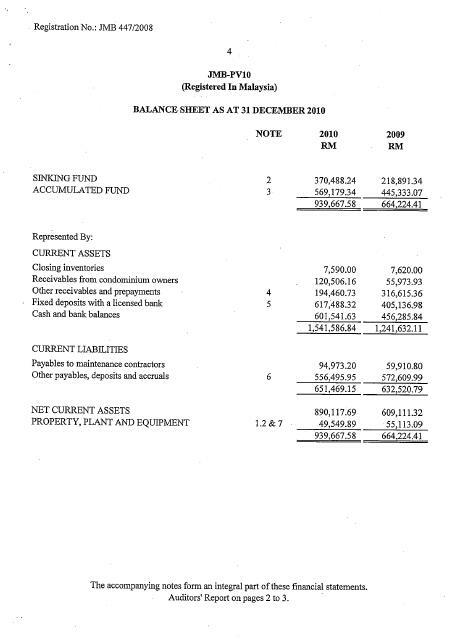 V can do wonder with the 8.34mil in surplus or the 7.5mil in surplus if BMF is used to offset annual insurance premium. The surplus should be more than sufficient to take care of all the big expense items. Moreover, we didn’t take into account the compound interest we will gain in 10 years. See Said : ALL are reserves had gone towards replacing the controllers for the twelve lifts. Comment : Since all the reserves are being used up, how to foot the bill for the 80k. Quite contradictory. See Said: Please don’t mislead the owners by mentioning that some of low cost and medium cost apartments are using the BMF fund to pay for the insurance premium without any reference. Name the apartments that do so. Comment : Section 1, 2 & 4 MCs are doing so. They can survive for >20years with meagre maintenance fee of RM20 per month (slightly more than our sinking fund) per unit with pay up rate of 70%. See Said : For your info, after paying for all the bills ( except for the security ) for the month of Feb and March, we have only a balance of 70K + in the bank. The security bill for Feb and March is 60K. When the liability period is over, we also need to pay for the routine maintenance of the lifts and the pool. 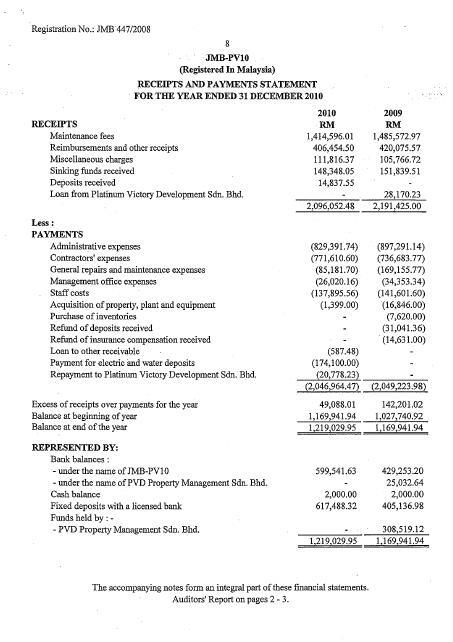 Comment : The 243k bal carried forward to Mar is not plucked from the thin air but from JMC’s monthly financial report. See Said : Mr Raymond , please make an appointment with any of the committee member or the chairman to browse through all the payment vouchers. Just name the day and the time at your convenience, I shall be there. As stipulated in the Act 663, an owner has every right to make a request to look into the account so by all means exercise that right. The bank statements are all there in the JMB office, practically at your door step. You are practically misleading the owners without having the details of the account. Comment : The urge is reminiscent of the urges of the executive directors of some cash rich public listed companies which were later gone bankrupt due to dubious transaction. It’s difficult to detect CBT cases committed by professionals, esp at its infancy. See Said :Assuming that all the owners paid up, we collected about 120K for sinking fund every year. In a period of ten years, we collected only about 1.2 million. A repainting job may cost about 1 million in ten years time after accounting for the increase in labour cost and the paint. Comment : Expect sinking fund to remian untouched for next 9 years. What will be the compound interest we gain if it’s put in the F.D account. The fund is DEFINITELY much larger than what u claimed in 10 years time. See said :In ten years time, you may need to replace the controllers of the lifts which may have a lifespan of 10-15 years ( Genting Court management change 6 controllers at the cost of 300K + after ten years ). Our controller may cost about 100K in another ten years. We have ten lifts. It may cost us another million. Comment : plis do not over-exaggerated the figures. Don’t forget our IETA lift is one of the low end brand. Correspondingly, its spare parts are much cheaper. Also, the cost of the spare parts are not expected to double-up in 10 years time. from yr comments, v know u r prosperous in all yr undertakings with numerous properties currently under yr possession. U must be lucky to be born to wealth or worked hard to get that far. in conclusion, our revenue is 8.34mil more than GC in 10 years time, discounting the compound interest we are going to receive, but u still unduly worry that we will land up the same faith as GC. Probably it’s the right time to look at our current big cost items, such as security, janitor service, etc, and proactively initiating some prudent cost cutting measures without being asked for. his share of insurance premium? Plis advise. really appreciate JMC’s good effort to convince developer to right their wrong. This is undoubtedly the greatest achievement of JMC thus far. We had definitely won a battle but not the war yet. now, you are comparing our condo with those from section 1 and 2 of which the insurance premium is only a fraction of what we are paying. they have nothing, no swimming pool, no lifts, no gen-set and the only workers they engage are sweepers. why don’t you find out from the management of Menara Alpha, Metroview and others around Wangsa Maju. WHAT DOES THE ABOVE COMMENT HAVE ANYTHING TO DO WITH THE ISSUE THAT WE ARE DISCUSSING HERE?? PLEASE SHOW SOME KIND OF MATURITY HERE. WHAT ARE YOU TRYING TO IMPLY? YOU DON’T HAVE TO RESORT TO ANY INSINUATION OR MAKING ANY HIDDEN ALLEGATION WHEN YOUR DEMANDS CANNOT BE ENTERTAINED. THERE IS NO NEED TO CREATE NEGATIVE SENTIMENTS AGAINST ME. MY CONSCIENCE IS VERY CLEAR. I HAVE NOTHING TO HIDE. 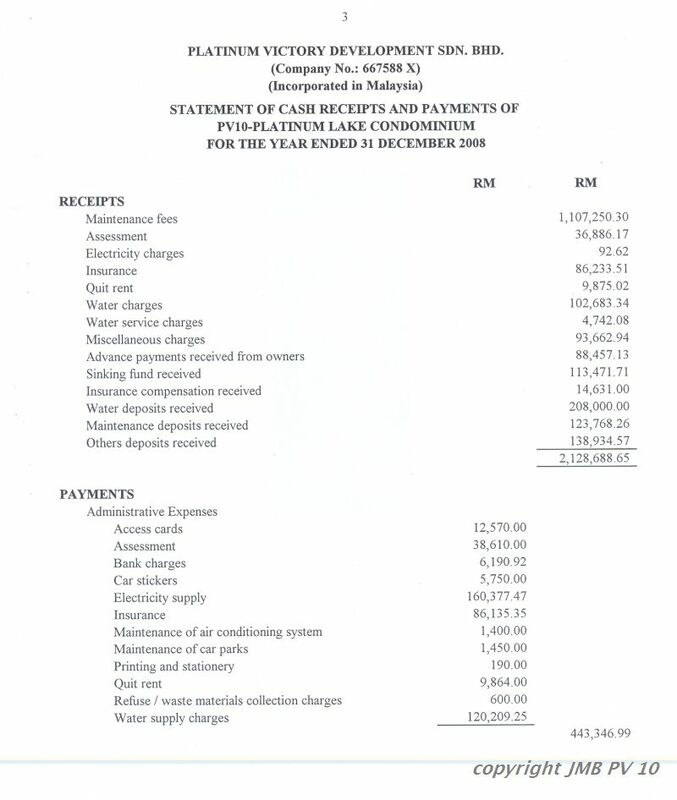 THE ONLY ITEM THAT THE JMC SPENT OUT OF THE BMF IS THE ” BOTLED PLAIN WATER ” ALTHOUGH UNDER ACT663, THEY ARE ENTITLED TO SOME kind of ALLOWANCE. DO YOU WANT ALL THE COMMITTEE MEMBERS TO DECLARE THEIR ASSETS IN ORDER TO WIN YOUR TRUST? WE CAN DO IT IF THAT’S WHAT YOU WISH. IF YOU ARE SO CONCENRED THAT A STRONG RESERVE MAY RESULT IN THE FUND BEING SIPHONED OFF TO A SECRET BANK ACCOUNT IN SWITZERLAND, YOU CAN TAKE THE INITIATIVE TO DO SOMETHING MORE FOR PV10 BY SETTING UP AN ” AD-HOC ” COMMITTEE TO LOOK INTO OUR ACCOUNTS instead of just commenting comfortably in your office through the blog. WE CAN HAVE REGULAR MEETINGS AND IF YOU FIND ANY IRREGULARTIES, DON’T HESITATE TO CAL MACC. PLEASE PUT THEIR NUMBER UNDER SPEED DIALLING TOO. When I spoke of Genting Court, I was quoting from facts. City One condo, a high end condo in front of Wilayah Complex is another good example. Allegations, accusations and insinuations from the common folks are normal in any condo. “Somebody is taking 10% cut “, ” itu mesti ada apa-apa punya “, ” kang hai yau cheok soh ” These are commong phrases you hear in the condo coming out from the common folks. For the educated ones, please support your allegations with facts and figures. I had made an open invitation for one of the commentators to make an appointment with any of the commiittee member to look into the account but so far we had heard nothing from him. there are 2 sides for a coin. It’s yr choice to choose the side u want to view. The same with the half-filled bottle, u can say it’s half full or half empty. The bottom-line is it depends on yr mindset. If u r an honest man with great integrity and principle, u should view it positively and take my comment as compliment and a form of congratulation. Otherwise, u can get yourself agitated, annoyed, and depressed by regarding it as allegation, accusation or insinuation, whatever choice of negative looking words u wish to apply. We don’t hv to get further embroiled on whether there’s any implication in the comment. All and sundry, u don’t hv to feel guilty if u uphold yr good life principles and consistently practise what u preached. See said : now, you are comparing our condo with those from section 1 and 2 of which the insurance premium is only a fraction of what we are paying. they have nothing, no swimming pool, no lifts, no gen-set and the only workers they engage are sweepers. why don’t you find out from the management of Menara Alpha, Metroview and others around Wangsa Maju. I merely quoted some stratefied properties closest to ours that used BMF to paid off their insurance premium since u r adamantly sure that there’s none in this region. Just to prove the point that i misled nobody thus far. I agree with u that their insurance premium is a fraction of ours but their maintenance charge is merely 1/8 of ours. Ability to use BMF to pay off insurance premium (governed by COB) with RM20 maintenance charge is a great feat by itself. More so their pay up rate is less than 70%. They succeeded in doing so for 20 years consistently without attempting to impose heavier charge. We shall try to emulate their achievement. a good proposal on transparency from Mr See. Owners with free time to spare are encouraged to form an AD-HOC committee to conduct regular audit on our BMF/sinking fund accounts. the challenge has been thrown to you. be a doer and not merely a writer. do something for PV10 by taking the lead to set up an ad-hoc committee. there is no paper work involved. you don’t even have to register with ROS for recognition. i guess time is not an issue. you can even write during the working hours. By making the unwarranted comment which has nothing to do with the issue, you , for someone who had received an overseas education should be able to diffrenciate between a compliment and a subtle allegation. the above sarcastic remark is truly humiliating people without undergoing tertiary education oversea. Plis show yr great wisdom eventhough u r allegedly offended and under pressure. The purpose of this blog is to offer writers an opportunity to view their opinions, be it constructive or not and the empowered doers to pick up the constructive ones for actions. The writers and doers are complementing each other for the success of this blog. U can choose to ignore all the feedbacks u deemed destructive or irrelevant. This is a free world. It’s our choice to be either a doer or a writer or both based on our personal decision and not others. Don’t ever try again to repeat making the above-mentioned humiliating remarks to put yr holistic profession in shame. now, you find such a remark sarcastic. you have feeling and others do not. you started the whole thing with a comment that had nothing to do with the issue. you reserve the right to comment and I reserve my right to reply to the comment. What is so shameful about my profession making such a remark! You should give the issue a deep thought by coming out with such a subtle allegation. You and I should know your comment carries a message to remind all the owners. u r actually humiliating all the owners in particular and Malaysian in general who studied up to tertiary level locally. U implied all of them are not knowledgeable enough to differentiate the so-called subtle allegation and compliment and our education system need a thorough revamp. Only u who studied abroad is capable of doing so. I think this may be a boomerang game u played to get yourself hurt eventually. We shall rightfully respect all of them irrespective of their education background. I hv made my stand clear enough and i can’t stop u who insist to continue yr wild guessing. My advice to u is stop the rot and start working for the well-being of the residents. I appreciate what both of you try to imply and I hope we should only discuss the BMF account for the benefit of all owners of PV10. Lets not get carried away on trivial matters. Lets make up and continue with our efforts to make PV10 a pleasant place to stay and be proud of it.